It was quite fun for me, for the first time reading my writings in an American journal. 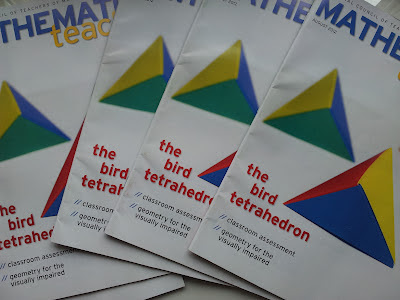 I have written about the bird tetrahedron in Norwegian in Tangenten (2005) and I recently elaborated on this topic and expanded the original article into a new one for MT. You can read the English version on jstor or the august issue of Mathematics Teacher from NCTM. I loved the way they made those nice graphics and photos for the front and illustrations! There are also some templates you download in PDF from the Mathematics Teacher website. I could be better at writing about, or ranting about, books I read, especially when they are connected to science, teaching or research. 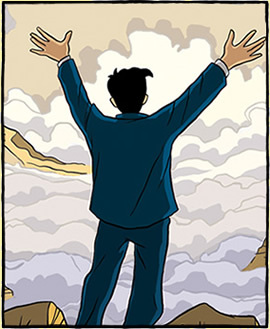 The other day I read a comic book called Logicomix. This may seem unserious, and no doubt, comics and comic books are considered more childish in Norway, than in, say, UK or US. At least that is my impression. As a young collector I have always been into comics and even in this country there have been, at least a few, to share the interest with. This book is a kind of drawn version of a lecture given by Bertrand Russell, about his life, philosophies and pursue of absolute truth. What on earth (or rather, elsewhere..) could we know, and how can we be sure? What can we be absolute sure of? The excuse for the lecture is a contemporary debate on whether US should join in the war on the English side. How can we be sure we do the absolute correct thing? In this book, we get to know Russell, his life and story, his more or less strange love stories, some of his paradoxes and contradictions, as well as a number of other mathematicians and philosophers. Frege, Wittgenstein, Cantor and Hilbert all show their faces. The book has its own website, and you can get some tastes of it there. It can also be ordered (free shipping) on play.com – and cheap! Just what the cheap researcher ordered. This is so hard. I am talking about committing yourself to a database of some sort, and this time it’s the reference database I am worrying about. If you collect a lot of music or movies and catalog them extensively, you know what a drag it is when you figure you have chosen the wrong database or cataloging software. (So far I have been pleased with Mediamonkey (http://www.mediamonkey.com) for the music and it seems XBMC (http://www.xbmc.org) will do the trick for flipping through your movies with style. But I digress. Now I want to catalog, sort and search my references, so what software should I commit to? I used to be an EndNote user as long as I got it for free, but no more. I had to look for free options (I AM the cheap researcher). First to come along was zotero (http://www.zotero.org), and believe me, it is still excellent. It is a Firefox add-on which allows you to add references from bookstores and article bases with ease. It then integrates with Word for easy use when referencing in your writing. The coming (now in beta) version includes sync to web, so that you have your references at hand at all times. Great. Converting from EndNote was a nightmare, but most of my thousands of references went along with the swap after some tinkering. Then I got Word 2007, which had a built-in reference manager. This might have been the best option, but I found the managing capabilities a bit wanting. Finally I have tried Mendeley (http://www.mendeley.com/), a manager with a sync’ed software and web version, with capabilities to store and extract information from pdf-files. But what to choose? This is almost a lifetime commitment (ok, it is not, but it would be nice if it was) so it’s important to chose right! Heeeelp…. One of the tools I have began to love the most is this free add-on for FireFox. I used to be a fan of EndNote, which is a great program, but it wasn’t free… And I AM the CHEAP researcher after all. Zotero allows you to store references in a database, and later on insert the references into, say, Microsoft Word. Inside Word, you look up the reference you want and automagically a bibliography is created at the back. There’s a great little feature that you can store files with it, so that the pdf’s you refer to are in the right place. Another extremly handy function is the way you can get references into the database. Whenever you are on a library site or a bookstore site, you get a zotero icon next to the URL. ‘Click’, and the reference is added to your database. Great. The coming version of zotero will support external cloud storage of references, so you can reach your references from whatever computer you are on. At present the best way might be to keep the zotero files in a folder that you sync with DropBox, mentioned earlier on my blog. Try this add-on for yourself, and see if you are satisfied!